Usually, if you want to send someone an email, you are supposed to know the email address, but that's not always the case. Many sites use contact forms and now it's very easy to create one using Google Drive. A few years ago, Google Profiles added a contact form, but it was disabled by default. Google+ made it easy to send someone a message: just add "+", mention his name and he will probably receive a notification, depending on his notification settings. Now you can send email to the people from your Google+ circles even if you don't have their email addresses. Gmail will show suggestions from your Google+ circles when you compose an email and will send your email without showing you the address. "Your email address isn't visible to a Google+ connection unless you send that person an email, and likewise, that person's email address isn't visible to you unless they send you an email." Suggestions from Google+ are placed at the bottom of the list, below the suggestions from your address book. As you can see, email addresses aren't included. Google will only show suggestions from your circles, but you can add anyone to your circles. What happens when you send an email to someone? If you are in his circles, the message will be placed in the Personal inbox tab. Otherwise, it will be added to the Social tab and you won't be able to send another message until the person responds or adds you to his circles. By default, anyone who circles you can send you an email message in Gmail. If you have many followers, the default setting will limit the messages to your circles. You can alway edit the scope of this feature in Gmail's settings. Find the "Email via Google+" section and choose from "Anyone on Google+", "Extended circles", "Circles" and "No one". Pick "No one" to completely disable this feature. The feature is gradually rolled out. You'll receive a message from Google with the following subject: "Gmail update: Reach more people you know". It starts like this: "Ever wanted to email someone you know, but haven't yet exchanged email addresses? Starting this week, when you're composing a new email, Gmail will suggest your Google+ connections as recipients, even if you haven't exchanged email addresses yet." Even if you receive the message, you might still have to wait until the feature is enabled. "You can only send emails to your Google+ connections with the desktop version of Gmail," informs the Gmail help center. 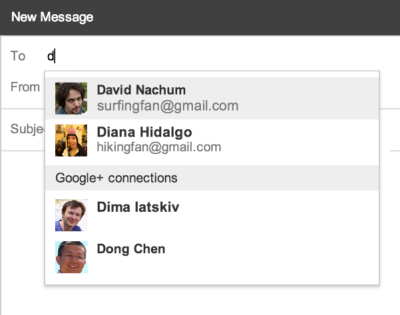 Gmail is now even more integrated with Google+. Gmail shows your circles in the sidebar, loads Google+ notifications and allows you to reply from the Gmail interface and now it lets you send email to Google+ users without knowing their addresses. The new feature makes Gmail more useful because it unlocks the power of circles, but it can also lead to more spam. Since anyone who adds you to a circle can send you an email, you'll have to deal with that. If you have many followers, Google already limits this feature to your circles. You can also receive spam messages in Google+, so that's not something new. It's interesting that the default setting for most people is "anyone". The default setting for notifications and the contact form is "extended circles", which include your circles and your circles' circles. The contact form from the profile is even disabled by default. not only that, this feature simply does not work... i have people in my circles as "friends" and gmail NEVER suggests their contacts as potential recipients even after i type out their full google+ nickname. for once i needed to send an email to someone in my circles without knowing their email and after half an hour of googling out various ways it SHOULD work, i conclude that it simply doesnt. i repeat... i do have a person in my circles, i start putting down their name into the gmail mail compose thingie as a recipient and it simply doesnt work. i have tried it with many other names in my circles just to be sure, and nope, it is not working at all.